Competitive Edge Products is delighted to present the famous Lifetime 5' Round Utility Table. With so many available these days, it is good to have a name you can trust. The Lifetime 5' Round Utility Table is certainly that and will be a superb purchase. For this great price, the Lifetime 5' Round Utility Table is widely recommended and is a regular choice for most people. The Manufacturer has added some great touches and this means good value for money. Life time ® folding tables are built of high-density polyethylene, which is stronger, lighter and more resilient than wood. This 5-ft utility table showcases a powder-coated, weather-resistant steel frame, built for indoor or outdoor use. 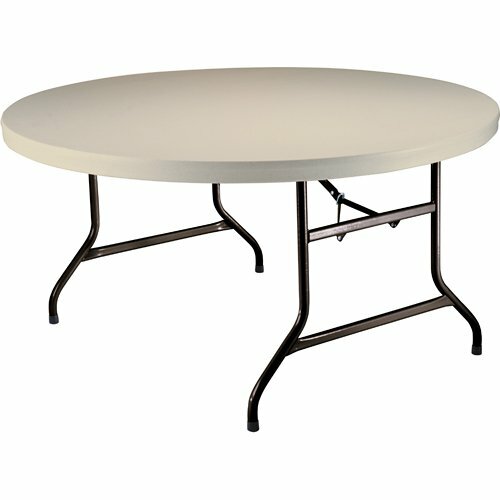 View YouTube Video "80131 Round 5 ft Lifetime Table and Cart"
Click here to view our Lifetime Tables: http://www.competitiveedgeproducts.com/SearchResult.aspx?CategoryID=11.